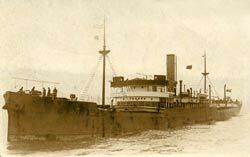 SS Edernian, Golden Cross Line, "Llong Pwll Parc"
On the 30th of March 1917, She struck a mine in the English Channel, but managed to reach Dieppe for dry dock and repair. On the 20th of August 1917, she was torpedoed by a German U-boat, and this time was sunk, six miles south east of Southwold, whilst bound from Middlesborough to Dieppe with a cargo of steel. 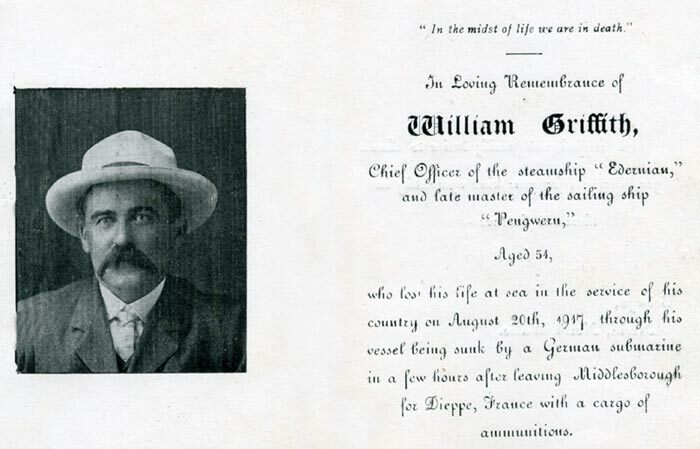 Fourteen lives were lost, including her Master, Chief Officer William Griffith, Nefyn, William Roberts, Edern and his friend Hugh Griffith Hughes, Nefyn, both Ordinary Seaman. The two of them were just seventeen years old. This was a tragedy of mammoth proportion for Llyn, and Edern in particular, being a small village with a closely knit community of seafarers, and their families. "William Roberts" (Hugh's Brother) "Hugh G Hughes" "William Griffith"
In the Fleet 1906 – 1917. O.N.123166. 3588g. 2284n. 342.0 x 51.0 x 22.7 feet. T.3 –cyl by North Eastern Marine Engineering Co Ltd. Sunderland. 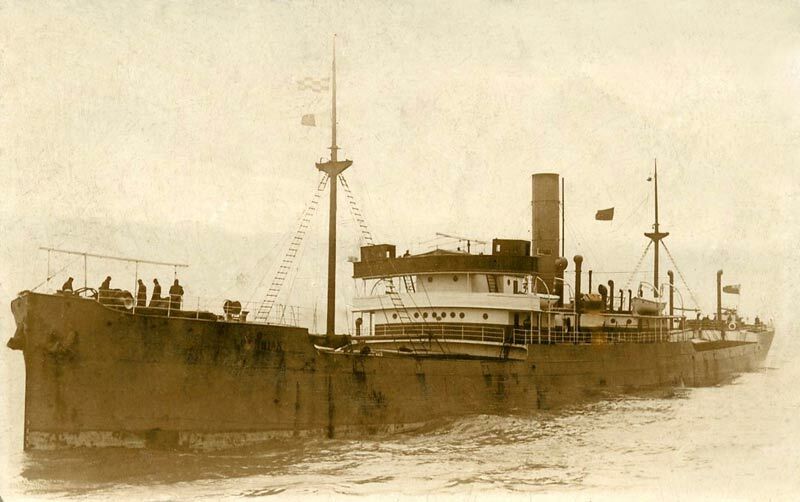 On the 29th March 1913 I joined the S S “Edernian” at Hull as Ordinary seaman, and proceeded to load general cargo at Antwerp and London for the Royal Mail co to ports in Brazil. The Master of this vessel was a native of Aberaeron and most of the deck crew were from the same locality. After the first voyage in this shop I was given ten shillings monthly, as extra to take care of morse and signaling in the Mate’s watch. On the first voyage cargo was discharged at Bahia Rio and Rio Grande again, but there was no delay in entering on this occasion, although there did not appear to be any more depth at the entrance. We then proceeded to Rosario and loaded Maize for Plymouth and Falmouth and finally Cardiff, dry docking and sailing in ballast on the 31st August 1913 for Nordenham, Germany, where we loaded a full cargo of salt for Wilmington N.C. U.S.A. Approaching the American coast we ran in to heavy weather, two ports, frames and deadlights in our forecastle being driven clean out and flooding us out. We went to sleep after this in the potato locker above the transom aft, and one morning noticing the propeller had stopped, we came out and found that we had nearly run into a derelict American three masted schooner lying flat on her side, and her keel at sea surface level. On our arrival at Wilmington we were informed she had been run down by a steamer the previous night, all crew saved. So as not to cause danger to shipping she was destroyed by an American Coastguard Cutter. 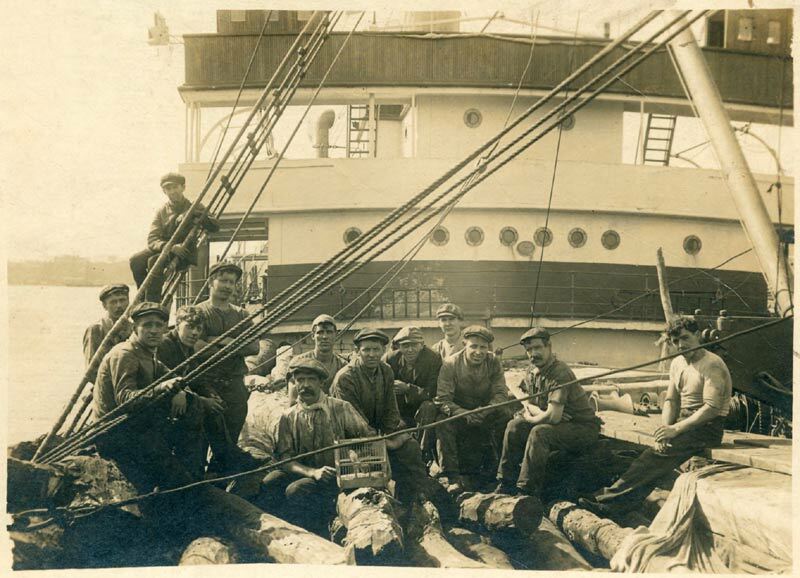 After discharging the salt we loaded cotton for Havre and completed the voyage at Penarth on the 14th December 1913. We left, loaded with coal for Rio de Janeiro on the 19th December 1913, discharged and went in ballast to Baltimore to load coal for Savona, on this passage we met with very severe weather, and after discharging at Savona sailed for home in ballast. Head winds on the Portugese coast compelled us to flood the after holds as the ship was unmanageable. We arrived Barry Dock on the 18th April 1914 and had nearly completed loading coal for Algiers when it was found that No 1 ballast tank could not be got empty owing to a leak somewhere, which was found by a diver to be due to loose rivets. These were wedged up by the diver and heavy cement boxes were fitted to enable us to sail on the 24th April 1914. Having discharged at Algiers we proceeded to load salt at Cadiz for Buenos Ayres. Having reached B.A. after a slow passage, to save fuel, we discharged our salt and washed out the holds, but no grain cargo could be had after a salt cargo. Whilst waiting for a charter our bunker coal got overheated and about 600 tons had to be removed and placed on the after deck by the ship’s crew. This took some days and when we had all the coal out most of it was condemned as no longer being safe, as it had been badly overheated. Our next loading port was up the River Plate at Santa Fee, and the cargo was Quebrachio wood, a form of swamp timber, very hard, and heavy, used apparently by tanneries. At this time the 1914 – 18 War commenced. We eventually sailed for New York via St Lucia and must have passed close to the German Cruiser Dresden on this journey. Having discharged at New York we loaded wheat for home, and when off North Ireland we were intercepted by H.M. Destroyer Stork and we were told to proceed to Lough Foyle where we remained some days. D. Alban Thomas, Aberaeron, 35. W. Griffith, Nefyn, 1st mate. 45. 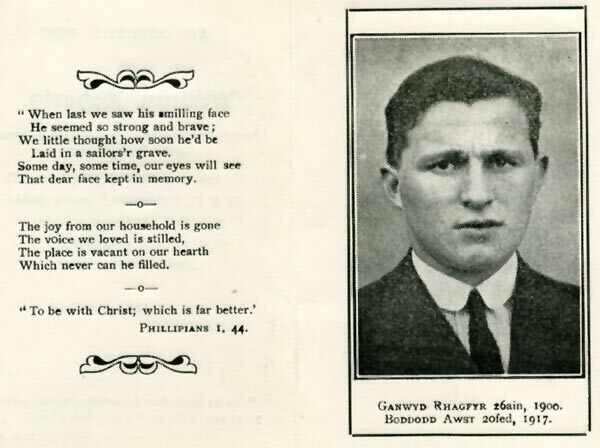 Ll Owen, Llanbedrog, 2nd mate, 20. 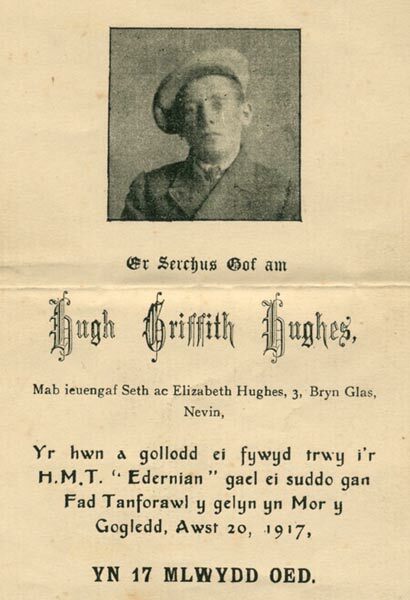 E Griffiths, Pwllheli, 1st engineer, 41. T Evans, Caernarfon, 2nd engineer, 51. J.R Sanderson, Gareshaed, 3rd engineer, 28. F. Nairn, Dublin, 4th engineer, 22. D. Jones, Aberaeron, bosun, 41. R. Williams, Edern, AB, 19. D. Evans, Aberaeron,, AB, 19. R.O. Griffiths, Nefyn, OS, 17. J Hakanson, Cardiff (Swedish), donkeyman. 23. J. Dobson, Pwllheli, Fireman, 33. E. Noon, Hull, Fireman. 34. A Bearman, Portsmoouth, fireman, 45. J. Simpson, Nelson, fireman. 24. J Gillick, Plymouth, fireman, 34. F. Silva, (spanish), fireman, 27. T. J. Williams, Pwllheli, steward, 34. D. J Griffiths, Nefyn, Master’s Steward 15. J Villa, Malta, cook 59. As we were routed via Irish Sea and English Channel to go to Hull our Master engaged a Coastal Pilot. He wore a top hat and frockcoat and appeared familiar with all shore objects as far as Belfast Lough, beyond that point he was unable to recognise any shore mark. He informed the Master that he had only taken the job in order to visit his relatives at Hull. We paid off at Hull on the 11th November 1914 and signed on again on the 9th December 1914 and left with a cargo of coal for Rouen, and then on to Barry Dock in ballast. We left Havre Roads in fine weather but ran into a full South Westerly gale off the Lizard, all hands having to work lifting the ceiling boards off No 4 tank top so as to allow flooding of this compartment. We were nearly ashore on the Lizard when we ran the water into the hold. And we were able to crawl off the land, and sideways past the Longships Light House off Lands End soon after dark. At Barry we took in bunkers and stores, and also 600 tons of clay and stone ballast on the upper deck, sailing on 5th January 1915 for Bermuda for orders. We sailed at the same time as two other North Atlantic traders, i.e. Larrinaga steamer and Cie. General Transatlantique steamer, they were out of sight before we reached Lundy Island. We passed well south of the Azores and when we had received our orders off South point Bermuda to proceed to Wilmington N.C. we carried on, and the next morning the two steamers that had left Barry on the same tide as us, crossed our bows on their way to the Gulf of Mexico. They must have been very surprised to see the old Edernian, which could only do eight knots, all out, at that spot, they must have had a lot of bad weather on their Northerly Track. After passing Bermuda we had to throw 600 tons of ballast over the side, and this was indeed a back breaking job, but we managed to get rid of the lot before we sighted our destination. At Wilmington we loaded a full cargo of cotton, just over 17,000 bales of it and brought it to Liverpool, paying off on the 20th February 1915. We signed on again on the 7th March 1915 under a new Master, and loaded a full cargo of coal and some naval stores at Barry, and eventually arrived at St Vincent, Cape Verde Islands at the end of March, and remained there until early October when we left for Key West for orders. 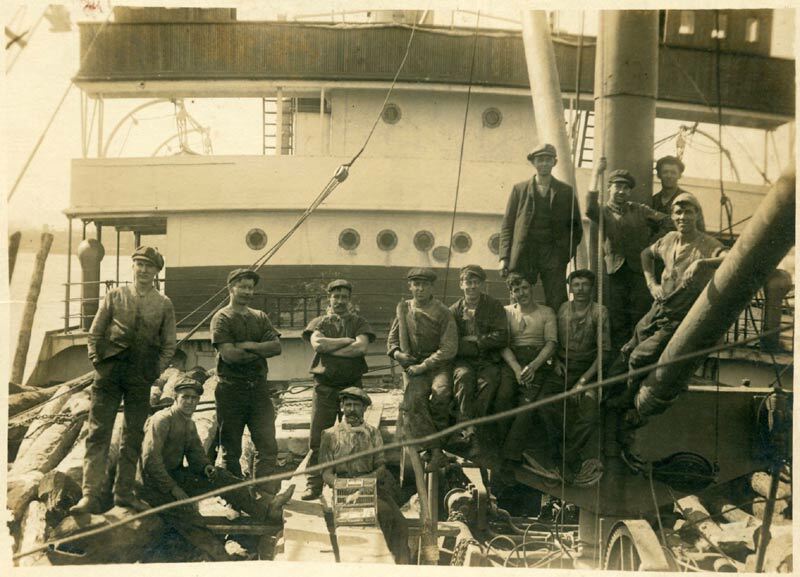 We could only crawl across the ocean, and eventually made New York, where we loaded wheat, after a 28 day passage from New York in very good weather we arrived at London, and paid off there on 29th November 1915.